While consumer products today have shelf lives measured in months, perfection came early to the tea whisk. How early? Tanimura Tango, who is the latest descendant of a family that has been making tea whisks or chasen for 20 generations, reckons about five centuries ago. Tanimura-san chuckles and says “we haven’t introduced new products for a very long time, and that is probably a terrible model for companies today”. 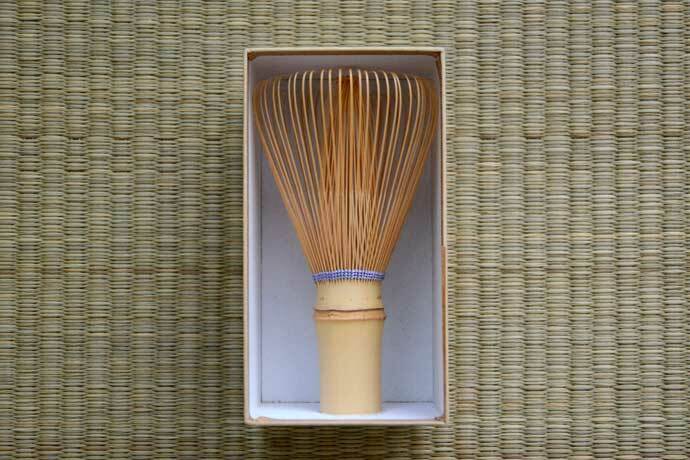 Shin-kazuho tea whisk by Tanimura Tango. 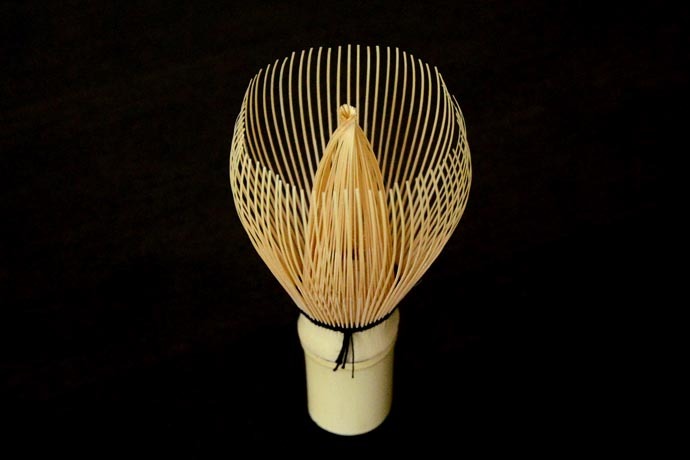 This type of whisk is used by the grand master of Urasenke tea school. But in place of innovation is a devotion to listening to the specific needs of the user. This is why the Tanimura family makes nearly 100 types and forms of chasen required by different tea schools. “While the chasen was perfected many years ago and the process of making them has remained the same for generations, it is my responsibility to maintain the forms and quality”, Tanimura-san elaborates. A good chasen is durable and easy to use. “These two elements directly conflict with each other because usability is created by the flexibility of the tines, but if they are too flexible they break easily. Strength and usability have to be balanced carefully and only bamboo can fulfill these requirements within the form,” Tanimura-san explains. The current forms of bamboo chasen were established in the early 1500s around the time when Tanimura-san’s ancestors began making chasen in the hills of Takayama in Nara prefecture. Legend has it that the chasen was originally developed by a prominent poet named Takayama Souzei (-1455), the son of the local ruling family, with advice from his friend and founder of wabi-tea Murata Juko (1423–1502). At the heart of the perfect chasen is the bamboo that it is made from. The chasen is made using bamboo that is harvested locally in the Kansai area during the winter. Bamboo from colder regions is too hard, while that from warmer regions is too soft. The harvested bamboo is boiled then sun dried for a month and stored to rest and dry for another 2-3 years. Different types of bamboo are needed to fulfill the requirements of various tea schools. For example, Urasenke uses white bamboo (hachiku) whereas Omote Senke uses smoked bamboo (susudake) and Mushakouji Senke uses black bamboo (kurotake). Master chasen maker Tanimura Tango demonstrates how a chasen is made from a single piece of bamboo. Each chasen is made from a single piece of bamboo that is roughly 4.75” (12cm) long, and split by hand with a small knife. The number of outer tines on a whisk can be up to about 120 and the thickness of the bamboo increases with the number of tines. To make a 70 tined chasen, the bamboo has to be split into 140 pieces to create the inner and outer tines. The inner and outer tines are split alternately. The inner tines are thinner than the outer tines. After splitting the bamboo, the top halves of the outer tines are carefully shaved down to give flexibility to the bamboo. This process is called ajikezuri and the process is often said to affect the flavor of tea prepared with that chasen. 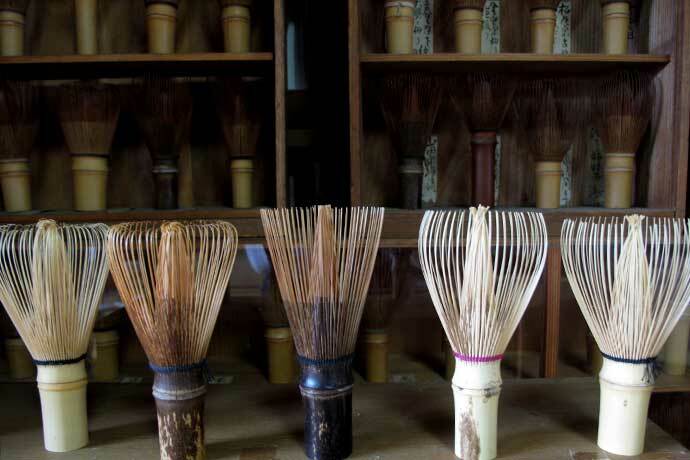 20th generation tea whisk maker Tanimura Tango demonstrates the Ajikezuri process. Historically, chasen makers owed their livelihoods to the support given by feudal lords and tea schools. The name “Tango” was bestowed on the Tanimura family by the Tokugawa Shogunate as the provider of tea whisks and carried on through successive generations. The Tanimura family continues to directly provide chasen to grand masters of many leading tea schools to this day. “It is a big responsibility and privilege to be able to get my work reviewed directly by the users. Some days they praise me and I get motivated, other days they scold me and I strive to do better. I believe that our history and ability to listen to the voice of the end-user is our biggest asset”, Tanimura-san says. In the past, the chasen makers worked at night while the rest of the world slept, and the technique was exclusively taught to the eldest son to keep the process secret. Those days are long gone, and nowadays over 70 percent of the chasen sold in Japan are cheaper imports. Tanimura-san though believes that when used, it is easy to recognize the superior quality of Takayama chasen that has been rigorously user tested by the most discerning tea drinkers for centuries. While the forms of chasen are fixed, there are no rules as to the color of the strings tying the tines. Black is the standard color, but any colored ones can be applied for the appropriate occasion. This purple one by Tanimura Tango is ideal for celebrating May and the blooming of wisteria. While learning the way of tea (chado) allows people to bring beauty into their lives, elaborate formalities are not required for tea to be enjoyed. “As the former grand master of Urasenke once said to me, ‘for tea, some matcha, a tea bowl, and a tea whisk will suffice’. I wish that more people around the world will casually drink tea using the chasen from Takayama. In the five minutes of preparing and drinking tea, one can forget all their worries and problems. It is my dream to be a part of that,” Tanimura-san says. So have some tea and take a momentary respite from the world. And to make the tea, look no further than the chasen perfected at the hands of Tanimura-san and his predecessors over the ages. Hello, I would like to know where I can find more information over the many types of whisk as well if you can enlighten me more about the origin of Chasen, I have come across some information on a possible link to the origin of a whisk known as the Kesurikake.